One photo of an abandoned church includes "ghosts" covered in white cloths, and Niki says he has no idea what was underneath. 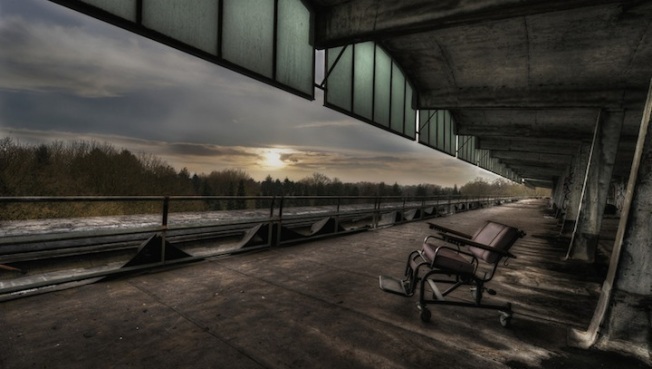 This is a shot taken of an abandoned nursing home. After taking a myriad of directions, Niki Feijen of The Netherlands has discovered his passion in photography, or Urbex. Wikipedia defines "Urbex" as "urban exploration--exploration of man-made structures, usually abandoned ruins or not usually seen components of the man-made environment." Feijen visits and photographs abandoned buildings, tunnels, castles, and more. The galleries on his site are eerie and unreal, as if taken straight out of a horror film. And in them, he finds, as he says on his site, "the beauty of decay." Niki took this photo of an abandoned church in 2012. In the pews, he says, "were nine 'ghosts' all dressed in winkle cloths. At least five times a week I get the same question -- 'what was underneath?' Well, I do not know. We never looked. I suppose some sort of framing. Nevertheless a very creepy but memorable experience." This photo is of an abandoned classroom in Pripyat, a Chernobyl Exclusion Zone. A photo of a nursery in Pripyat. A ferris wheel in Pripyat. This home was destroyed by rain that had poured through a hole in the ceiling for years, turning the carpet into moss, yet it still seems frozen in time. Even the fake flowers remain. A decayed organ remains inside an abandoned church. See Feijen's amazing photos on his website and Facebook page.